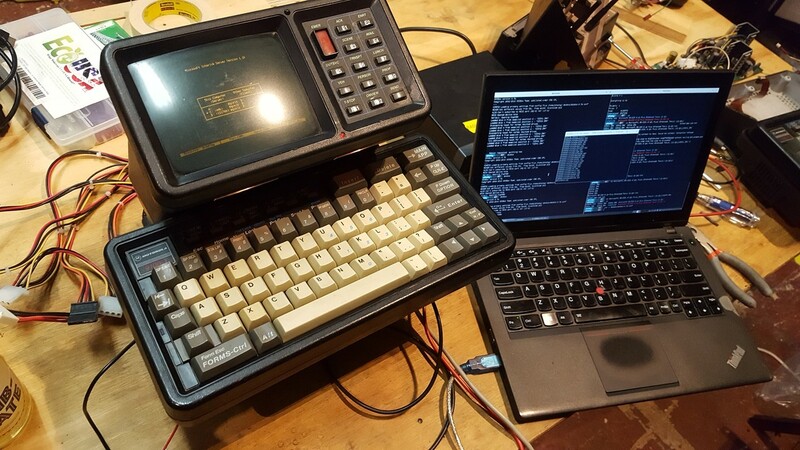 @er1n it&apos;s an MDT-9100T, a mobile terminal meant for installation in cars; I&apos;ve removed the radio component. @phooky @er1n I've seen modern versions of this used by London Ambulance Service (until they moved to Airwave/Tetra digital comms in the late 2000s) although prior to that the blue light services where I then lived (Reading, about 60km West of London) all still used analogue voice comms. @vfrmedia @er1n yes! I was hoping mine (an ebay find) would come with the crazy Phillips crypto pcmcia card, but no such luck. @bunnyhero @phooky @er1n would have made sense for such things as info about a patient, an incident report etc (no GUI so screens of forms would be filled in on the MDT and when it was complete "send" (possibly the # on the telephone style keypad) pressed to key the radio and transmit the data (usually as FSK). ISTR hearing this kind of data mixed in with voice when scanning on VHF low band in late 90s UK (think it was vehicle recovery services such AA/RAC).